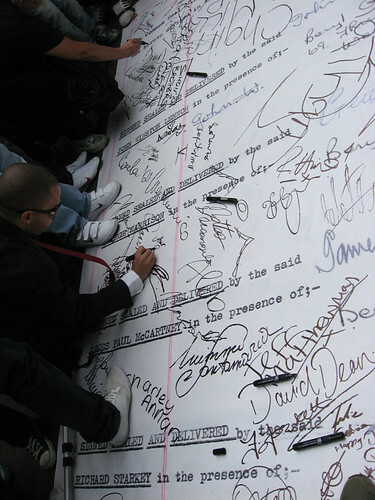 Last Tuesday, Beatle-lovers got the chance to sign a giant replica of the original contract signed by John Lennon, Paul McCartney, George Harrison and Ringo Starr during a type of flash mobbing on Carnaby Street, central London. 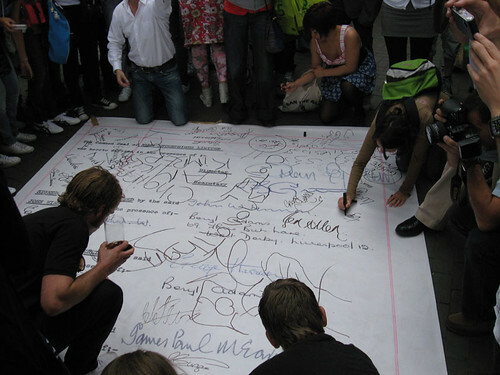 While fans signed their names, 'Imagine' was pumped out of speakers from the first floor of a nearby building. Apparently this was all linked to a competition with the prize being the chance to own the original contract (currently insured for £500,000). As you've probably guessed, I didn't win, I wasn't even aware there was a competition till I got home. The event was a little strange, like a quiet hysteria. I got pretty fed up with a guy who arrived late armed with a big video camera who then pushed right in, leaning on us, bashing us with his camera, basically showing no consideration for the people around them. Yes John, lets imagine that for one moment... now where's my prize?